Choosing a bridal party can be wrought with anxiety about who to include: questions like who included you, who are you closest to right now, who will you likely be closest to forever, how many is too many, how does your side compare to your fiancé's, what will everyone wear, whose feelings may be hurt? It may make you want to throw your hands up and forget the whole thing. But that can leave a hole around how to make it so that your most special peeps are close to you for your wedding, whether that be the day of, weekend of, or all the months leading up to as well. Bridal parties provide a kind of support while planning, shopping, and emotionally readying yourself for all the changes ahead. As I prepare for my sister's bachelorette party this weekend, my mind wanders to all the ways in which we women find or create ways to bond in the moments leading up to marriage. And I consider the ways in which I've seen that potential hole made into a really big, awesome circle! 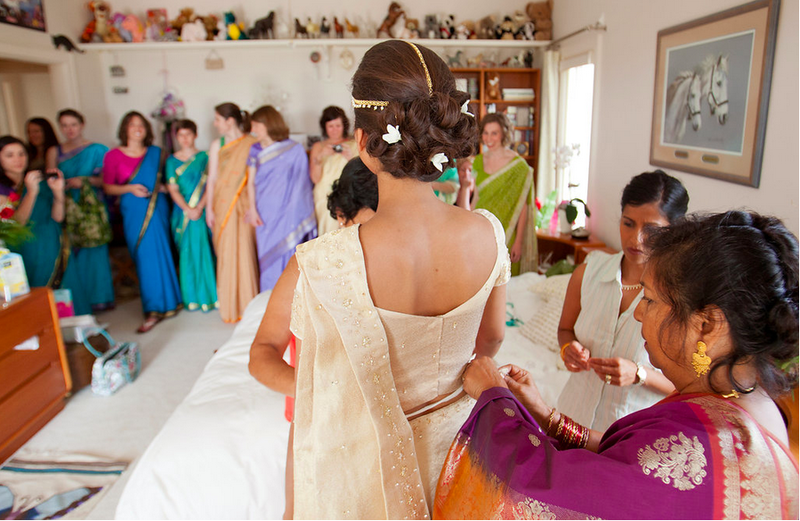 21 Saris: In Sri Lanka, it is tradition for the women to get ready for a wedding all together. Ranmali is Sri-Lankan/American and decided to make up a way to incorporate this into her Florida hometown wedding. Twenty-one of us girlfriends received an invite to this intriguing "21 Saris" party to be held at her parent's house on the afternoon of her wedding day. While Rami was being hair and make-up-ed, we girlfriends spent the afternoon choosing our sari, watching one another get sari-ed, peeking in on the bride, laughing and snacking, and being expertly wrapped in our saris by the bride's aunties. We were beautifully and colorfully sari-ed for the ceremony. Afterwards, we changed into our party dresses, but the special afternoon we had spent with the bride and her closest women was carried throughout the night. Mehendi Celebration: If you've ever been henna-ed, you know that this is a process you would not save for a time crunch...like the morning of your wedding. Aside from it being art, there are the logistics of washing and allowing it to set. In India, the bride hosts a mehendi party at her home on the eve of her wedding. It's a full on rocking party with food, music and most importantly, henna. Elaine is not Indian, but the man she married is. To honor her soon-to-be-husband's wedding traditions, and because it sounded like a great way to kick off the weekend of celebrations she hosted a mehendi party at her home in Boulder, which turned out to be one of her favorite wedding memories. Wait, don't be sad that you don't have one of the these traditions in your lineage! Make one up that fits for you. Organize a morning hike with your girlfriends. Depending on your crew, the season and various logistics, a bike, ski, soak in the hot tub, 5k run or another favorite activity could work too! Think of what you love to do and what could be easily shared with your special women. I'm drawn to the ceremonious ways surrounding vows that brides celebrate and bring together the women in their life. From your childhood best friend to your college roommate; your mom's best friend whom you call 'aunt' to your co-worker; your fiancé's cousin to the groomsman's wife; your almost mother-in-law to your grandma. There's something about joining your life with your best guy that makes weaving the women of your life together through a shared experience seem especially appropriate. Credits: The beautiful body art is by Hummingbird Henna. Elaine's henna photos, by the talented Rebecca Caridad at Manzanita. Ranmali's sari photos, by the fabulous Krystal at Verve Studio. A huge thank you to Elaine and Ranmali for sharing your stories!